Water quality is deteriorating all the time. Contamination from natural & man-made sources is on the increase. As the average human body is 70% water by weight, it makes sense that the water we consume should be the purest available. Many of us choose to consume bottled water but this is not necessarily the purest or the best. The only way to ensure you and your family are consuming the best water available is to purify it at the point of use. But what about all the minerals in tap water?. There are a few trace elements in tap water that are beneficial, most of them are not. All of the beneficial trace elements can be obtained in much larger quantities from a well balance diet. The highest mineral concentration in tap water is usually calcium (in hard water areas) up to 300mg per litre, but just take a look at the calcium you get from milk or cheese it far outweighs the small quantity from water. Ask your water company for a copy of the tests they have to carry out on your water supplies, and see for yourself exactly what's in every glass you drink. Already in use in industrial & medical processes such as pharmaceutical's, haemodialysis, semiconductor manufacture, kidney dialysis & sea water desalination. Reverse Osmosis has now become cost effective to use in the domestic environment. Advances in membrane technology have allowed the design & manufacture of affordable yet effective reverse osmosis systems for the home. Reverse Osmosis can treat a wide variety of health and aesthetic contaminants. Unpleasant tastes & odour caused by chlorine, sulphate's or chlorides are effectively removed. Contamination by arsenic, asbestos, atrazine, pesticides, herbicides, fluoride, lead, mercury, nitrate, radium, benzene, trichloroethylene, trihalomethanes and radon are all effectively removed providing the highest quality, pure drinking water. How to choose a reverse osmosis system from the wide range we offer. If you have reasonable water pressure above 40psi (check with you water company) any of the Series D models will work well at this pressure or above. Systems are offered in various configurations, simply put, the more stages the water passes through, the better the final quality. Systems are sized in US gallons per day (GPD) choose a system with approximately double the capacity you need. Remember to allow for drinking & cooking. If you have extremely low water pressure below 40psi choose a pumped system from our Series E range. For light commercial applications such as restaurants, hotels etc. choose from our Series LC range. All systems can be installed by a competent DIYer. If your not sure what's right for you call, fax or e-mail us for advice. Contact us. If you can work an electric drill, a spanner and a screwdriver then you you can install an R.O. system. 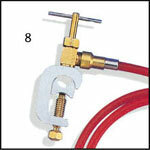 The connection to the cold water pipe is a "self-piercing" valve (Image 8 below) which clamped around the pipe will cut its own hole and self-sealing. 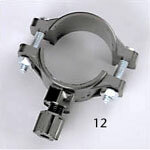 The connection to the waste pipe is a simple clamp & drill fitting (image 12 below) which is also self sealing. Lastly fitting the faucet/tap by drilling through your sink or work top. All fittings are "Push Fit" and all tubes & pipes are flexible. Every 6 months you will need to change the filters. Turn off the water to the R.O. at the valve, unscrew the filter hosing bodies with the spanner provided, remove the old filter cartridges, insert the new ones, turn back on and check for leaks. Every 24 to 36 months (dependent on water quality) you will need to change the membrane, turning of the water supply and removing the screw cap of the membrane housing, changing the membrane, turn back on and check for leaks. Both operations only take a few minutes each. 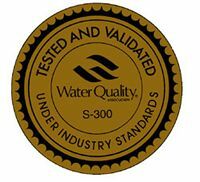 We selected TGI reverse osmosis systems because they offer such a wide range, and TGI's products have been awarded the Water Quality Associations Gold Seal S-300 for product performance, capacity & longevity. All systems are 100% tested in the factory before dispatch and are hermetically sealed to ensure worry free installation.